Ligue 1's top two teams, Marseille and Paris St-Germain, both lost 1-0 to open up the title race. Lyon now trail Marseille by only one point and PSG by two after their 3-0 win over Caen on Friday. Champions PSG lost their first league game of the season as Jeremy Pied scored Guingamp's only goal. Marseille were beaten by Monaco, last season's runners-up, Bernardo Silva scoring from 16 yards out after a dummy from Yannick Ferreira Carrasco. 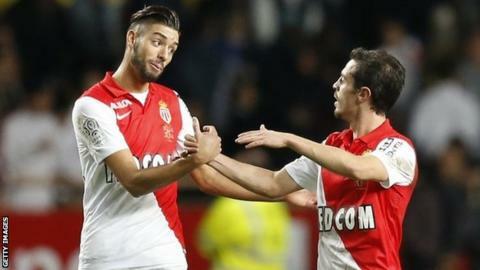 Monaco, who cut costs during the summer, moved up to sixth in the table with victory at Stade Louis II. Marseille handed a debut to 16-year-old Bilal Boutobba late on. Match ends, Monaco 1, Marseille 0. Second Half ends, Monaco 1, Marseille 0. Corner, Marseille. Conceded by Valère Germain. Delay in match Bilal Boutobba (Marseille) because of an injury. Lucas Ocampos (Monaco) is shown the yellow card for a bad foul. Bilal Boutobba (Marseille) wins a free kick on the right wing. Dangerous play by Lucas Ocampos (Monaco). Giannelli Imbula (Marseille) wins a free kick in the defensive half. Substitution, Monaco. Abdou Diallo replaces Bernardo Silva. Foul by Michy Batshuayi (Marseille). Corner, Marseille. Conceded by Jérémy Toulalan. Foul by André-Pierre Gignac (Marseille). Attempt saved. Lucas Ocampos (Monaco) left footed shot from the centre of the box is saved in the bottom right corner. Assisted by Bernardo Silva. Andrea Raggi (Monaco) is shown the yellow card for a bad foul. Bilal Boutobba (Marseille) wins a free kick in the attacking half. Foul by Andrea Raggi (Monaco). Substitution, Marseille. Bilal Boutobba replaces Mario Lemina. Corner, Marseille. Conceded by Lucas Ocampos. Hand ball by João Moutinho (Monaco). Substitution, Monaco. Valère Germain replaces Anthony Martial. Attempt blocked. Lucas Ocampos (Monaco) right footed shot from outside the box is blocked. Assisted by Yannick Ferreira-Carrasco. Substitution, Monaco. Lucas Ocampos replaces Nabil Dirar. Benjamin Mendy (Marseille) is shown the yellow card for a bad foul. Foul by Benjamin Mendy (Marseille). Brice Dja Djédjé (Marseille) wins a free kick on the right wing. Substitution, Marseille. Michy Batshuayi replaces André Ayew. Attempt missed. Andrea Raggi (Monaco) header from the centre of the box misses to the right. Assisted by João Moutinho with a cross following a corner. Corner, Monaco. Conceded by Benjamin Mendy.